Bob Gower’s personal narrative over the past seven decades offers a touching portrait of the American dream. SIU played a part in his story of accomplishment, generosity and determination. Born in West Frankfort to parents with an eighth-grade education, Gower knew that hard work was going to be his personal key to achieving success. Gower said that his experiences at SIU taught him so much about other people. He said those experiences taught him about character, taught him about honesty, and gave him an appreciation of diversity. “In West Frankfort, Illinois, there were no African-Americans in the 1950s. When I arrived at SIU, I met all types of people from other cultures and countries, and it was a new and stimulating experience. I learned about people, what drove them and how to work with others who did not come from my background,” he said. While he was a senior getting his undergraduate degree, Gower was encouraged by friends to go on a blind date with freshman Mary Beth Miller. “I remember sitting across from this beautiful young girl, sharing a soda with her when she told me she was taking a freshman chemistry course and could really use some help with it. I thought, God must be smiling on me right now. I knew I was good at chemistry and that I could help her,” he said. Fifty-eight years later, Gower credited his wife for helping him far more than when he helped her with her chemistry class. Gower went on to receive his bachelor’s and master’s degrees from SIU in 1958 and 1960, respectively, and his Ph.D. from the University of Minnesota in 1963. Upon graduation from SIU, Gower began an industrial career starting at Sinclair Oil Corporation as a research scientist. “I quickly realized that I was just as able as some of the people running the companies that I worked for, so I asked to be moved into sales and experienced a range of business development and planning positions to broaden my background,” he said. Gower soon rose to prominent positions in Atlantic Richfield and its divisions of the company. He became vice president of ARCO Chemical Co. in 1977 and senior vice president in 1979. In June 1984, he became senior vice president of Atlantic Richfield Co. Gower became president of Lyondell Petrochemical Co. when it was formed in April 1985 and was elected chief executive officer in October 1988. That same year, Gower led Lyondell through the largest initial public stock offering up to that time. 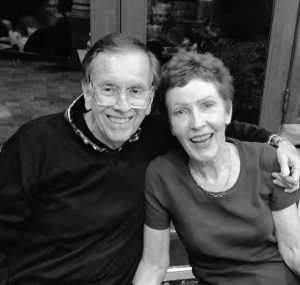 While Gower has had an illustrious career, he and his wife have always maintained a steadfast loyalty to SIU Carbondale’s chemistry department. Recently, Gower gave $800,000 to the department. One might think that with all of the success he achieved in his life, Gower would sit back and take it easy. Not so. One of his current passions is the field of nanotechnology, which he has used to help develop a therapeutic, abuse-resistant opioid pain drug. “It is currently in clinical trials, and the FDA recently gave Ensysce Biosciences a fast-track designation, which means we won’t have such a lengthy process to approval,” he said. Gower said that opioid drugs are the only way to handle certain types of severe pain, so simply banning them from use is not the answer. “The problem is that people quickly become addicted to opioid drugs,” he said. “We need to prevent abuse. What we have done with our drug is to modify it so that the drug is not active when taken. Only when it is in the digestive system and it meets an enzyme known as trypsin does it become activated via a two-step reaction. If a person snorts it or dissolves it and injects the drug, it will not be activated. If chewed, the reaction still will not take place until it gets to the digestive system. Gower is also passionate about providing opportunities for underprivileged children. For the past 30 years, he has worked with Communities in School, and he headed its operation in Houston for much of that time. CIS is a campus-based, nonprofit organization providing direct services and resources to under-served children with unmet needs, many with mental health issues. By surrounding them with a community of support, CIS empowers students to stay in school and achieve in life. “Anyone can do what I have done, or something better, or something comparable. Each of us brings our own unique set of contributions to society. Everyone is important on this stage,” he said. To find out how you can contribute to the SIU College of Science and the chemistry department, visit foreversiu.org/colleges-units/science. This entry was posted in Donor Stories, Higher Education, Illinois Higher Education, SIU by admin. Bookmark the permalink.